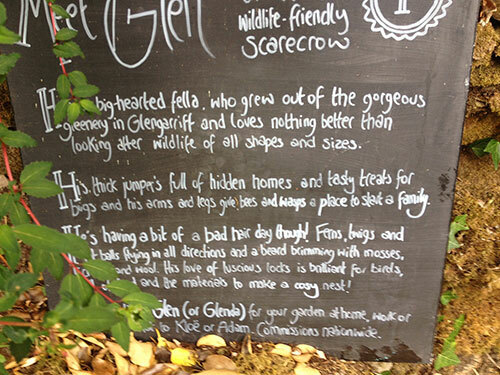 “He’s big-hearted fella who grew out of gorgeous greenery in Glengarriff and loves nothing better than looking after wildlife of all shapes and sizes. His thick jumper is full of hidden homes and tasty treats for bugs and his arms and legs gives bees and wasps a place to start a family. “From the start Glen was the opposite of what scarecrows usually do, which is scare you! And that’s where things became a lot of fun – I love using as many natural materials as possible and we are lucky our home is surrounded by an abundance of greenery, branches, leaves, and grasses. He looks sturdy – how was this achieved? “A large branch holds his birdfeeders and reclaimed scaffold boards gave his torso strength. His bug feeding jumper is stashed with woody materials like pine cones, twigs, rolled up cardboard, twigs, leaves – it’s a good mixture of materials for all the different types of bugs we wanted to attract. 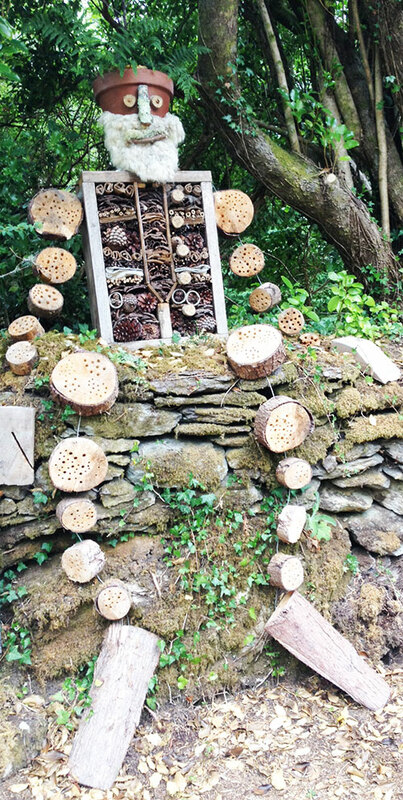 We used timber and logs from our garden for his legs and arms and cut logs in which we drilled different sized holes for the bugs and hefty wire was run through the logs to pull them together. As Glen became heavy, we made him in components – he looked quite gruesome at this stage – headless, armless and legless. Driving through Leap we found the perfect place for him on a stone wall facing the harbour. We put the parts together on site, in Leap, at the chosen spot, attaching the wire into his back happily in position to feed the birds and bugs. Glen and his new-found family now reside in Glengariff under a tree inside the Willy Wonka inspired edible paradise – The Garden of Re-Imagination. You can visit Glen as well as taste this magical Garden on a Taste Tour.